Many Ways to Learn: Horton Hears a Who...On Youtube! 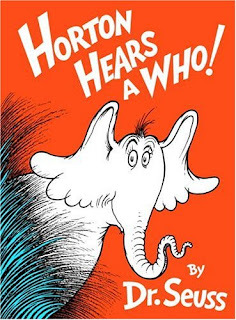 Horton Hears a Who...On Youtube! One of the things we here at the MWTL blog (a.k.a. me) are interested in is how people use the Internet and web 2.0 tools for learning. I have been exploring learning websites, blogs, twitter, yammer, etc. to figure out how people use these things for learning. Once again I found a great example right at home with my son Andrew. Andrew wanted to try out for the part of Horton, so he needed to do some research. He downloaded the Broadway soundtrack to his Ipod and then went onto wikipedia and looked up Seussical! to get an understanding of the plot. Next, he went to Youtube where he found many clips from local productions of the musical. By the time he went to audition, he was ready, having viewed and heard several different takes on the songs he needed to sing to impress his director. Andrew quickly learned what he needed and got the part. As his father, I'm happy for him and I'm looking forward to his performances in November. As a learning professional, I'm fascinated - and a little bit scared - by all of this. The people I am tasked to train in the corporate classroom have access to the same tools and resources that my son used to research his part. With that much information at their fingertips, we as trainers are no longer asked to fill the role of information provider. Our job is to help people embrace and use these tools to their best advantage. At my company, we have just begun to incorporate tools such as sharepoint, wikis, etc. into our learning programs. In a few years, my son and his friends will be entering the work force. Imagine what their expectations around learning will be. Tweet, Tweet, Tweet, What Does It All Mean? VILT = ILT...or Does It?